Russia actually doesn’t have a good reputation for its drivers and traffic conditions. We can easily find short videos on Youtube of unbelievable traffic accidents in Russia, from cars’ collisions until the fight between drivers. In 2010, the statistics showed that more than 2000 people killed in traffic accidents. The good news is, Russian governance keep improving the quality of the law enforcement and infrastructure. Those number of the victim died from traffic accidents are decreasing every year. Big cities in Russia like Moscow, that support humans population over 1 million people, have clean and ordered roads. However, just like other big cities in the world, the main problem is the same, traffic jams. Most of the population usually live in downtown thus the roads are always full of people who go to school, work, etc. Based on research, they predict that by 2020 as many as 7 out of 10 Russian families will use cars. Being competitive actually is like a trademark for people who live in metropolitan cities. They need more effort to thrive between so many people along with a high cost of living. Unfortunately, this competitiveness is brought by Russian people to roads, made them less considerate and patient. Some drivers often looked surging into intersections or cutting into lines, causing congestion and disturbing other traffic flows. If you drive in Russia, it’s important to be more considerate and patient. Fighting and honking don’t resolve the problem you have on roads, even worsen the traffic jams too. Choose your driving schedule wisely, avoid busy hours if you can. Give additional time to prevent you come late to your appointments. With those road conditions, it is necessary to prepare your dogs to face loud noises if you want to travel with your dogs or make sure your cats can obey your command to not make noise if you need to take them to veterinarians. The second fact about Russian drivers you need to know is their behavior of parking on roads. Lack of parking spaces is actually a common problem for a metropolitan city with so many residents thus people tend to park on any roads that are available. The worse problem caused by this behavior is the double-side parking that lead to bottleneck jam. If you plan to go to Russia, choose public transportation to go to your destination over driving cars if available. However, don’t be afraid to drive cars if you must. Park your car in the available parking spaces or if you don’t find any, choose the part of the roads to park your car wisely. Avoid double-parking, places that are prone to bottleneck jam like near bus stop or crowded intersections, and areas signed “NO PARKING”. Furthermore, if you travel with your pets, make sure you don’t leave them in your car. Active pets, especially dogs will get bored, and in the worst scenario, will die from dehydration. You also have to get rid your dog’s smelly odor first to avoid your car stinks from it. In a hurry, people can do anything. Drivers in Russia often take narrow streets to get to their destination quickly. Moreover, in metropolitan cities in Russia, there are many narrow street networks between the buildings and main roads. It causes no problem if you understand the city map completely. 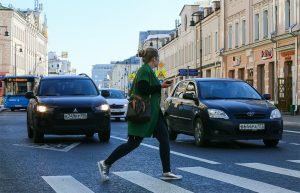 If you are new to Russian roads, avoid taking risks with running into narrow streets. If you get lost on those narrow streets, you’ll eventually lose the purpose of travel faster. Moreover, your action can lead to a traffic jam where it’ll be more troublesome on narrow streets than main roads. If you plan to get to your destination on a specific time, like seeing the sunset on a beach with your dog and family in the holiday season, put an additional time to your travel schedule instead run into narrow streets. Russia actually has the same problems with many developing countries in the world of driver licenses. The rapidly growing number of car drivers are not compatible with the system, resulting many drivers on roads have bought their licenses without selected on proper tests. Unfortunately, some police officers are corrupt enough to let these happened. Eventually, you’ll meet unskilled drivers on Russian roads. However, don’t let it bother you to travel by your car if you must. If you are a foreigner, make sure you get your driver license with the proper process. Avoid taking the risk with driving beyond the speed limit and take caution of every road signs. As we discussed in the previous section, some police officers are corrupt enough to let the mess happened. Moreover, they let drivers who break the rules free by bribing them. Some of the cases are small such as passing the red lights but some of the other cases are big enough to make chaos. The good news is, the government improve the facilities to avoid more of that chaos happen. Nowadays, you’ll find many traffic cameras in metropolitan cities in Russia. With more strict surveillance, they hope bad drivers and corrupted police officers will change the poor behaviors thus the traffic condition is more comfortable for any driver. These 5 facts about Russian Drivers you need to know is not meant to prove their bad reputation. Other countries actually have more severe cases than Russia. The most important thing if you decide to enjoy driving cars in Russia is, drive safely!